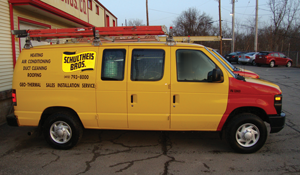 Schultheis Bros. stands out with time-tested yellow-and-red fleet. 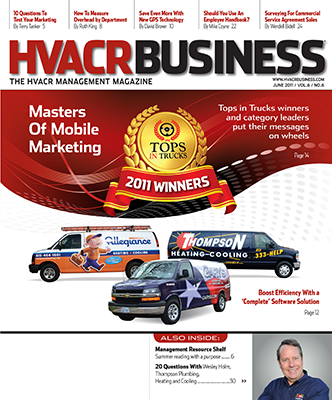 Before wraps and elaborate illustrations became popular for service fleet designs, HVACR companies used contrasting colors to draw attention to their trucks and vans. At some of these older companies, the original color combinations have become synonymous with their names. Company founders probably didn't realize they were taking an important step toward "branding,"but indeed they were. Adam Schultheis at Schultheis Bros., Pittsburgh, says the company would never dream of changing the color combo. His grandfather chose yellow and red for his fleet because they were the colors of his favorite high school basketball team uniforms. 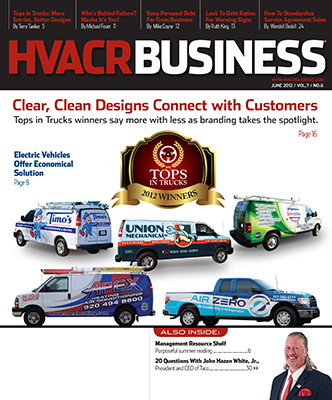 "Whether people are current customers or not, we are recognized by our vehicles,"says Schultheis, whose grandfather started the company in 1946. "People always say, 'I see your yellow trucks with the red fenders all over western Pennsylvania.'" And while the colors represent quality service, just as the Schultheis name does, they also stand out among competitors, Schultheis says. a white van with their logo on it,"he says. "As soon as we buy a new vehicle, we have it sent to be painted yellow and red."